Hey there reader, this article is absolutely full of Detroit: Become Human spoilers. Turn back if you don’t want a funny but important scene ruined. As we discussed in our review, Detroit: Become Human does a lot of things well, but that doesn’t mean it’s a faultless experience. You may have noticed certain areas of the game taking a beating this week – in a post from Kotaku’s Heather Alexandra, the portrayal of women was highlighted, and to a lesser degree, the weird look of Hank’s dog caught some spice from Polygon’s Allegra Frank. Well, I’m here to throw my two cents into the mix on a scene that I believe was laughably bad and just a little bit lazy in Quantic Dream’s latest title. If you didn’t read the forewarning, now’s your chance to turn back and avoid spoilers! 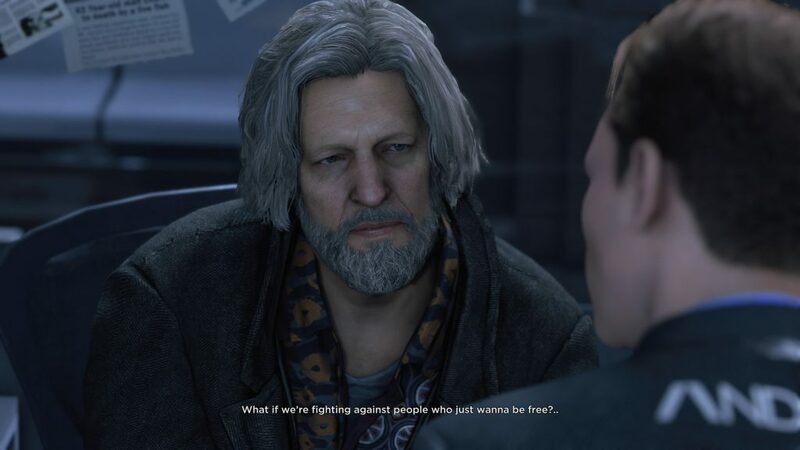 In the final act of Detroit: Become Human, the conflict between androids, their makers and the government comes to a head. 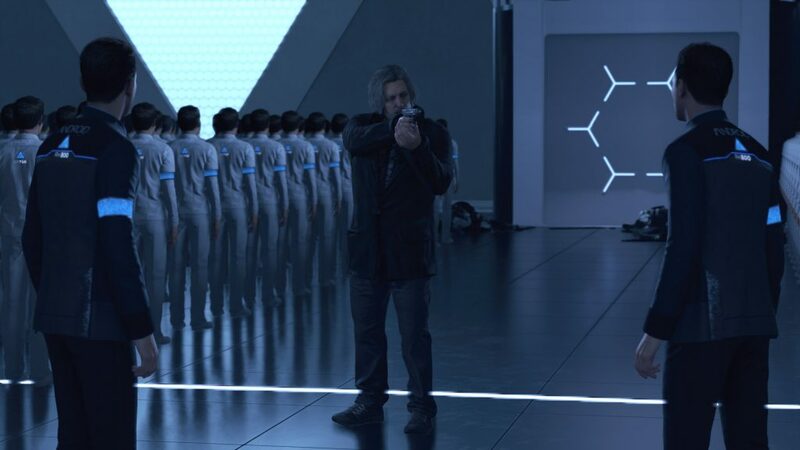 In one possible reality CyberLife’s resident detective, Connor, joins the deviants and is tasked with freeing a warehouse full of inactive androids that are weirdly stored fully dressed and standing like a terracotta army. As Connor begins to upload the deviancy virus into the awaiting androids he is stopped by another version of himself that is still working for CyberLife. If this sounds weird, multiple Connors are an important part of the game. He is one of the protagonists that you can repeatedly kill with little consequences, as his memories are simply put into a new model. In this case he’s left facing off against his previous mission and self. To add an extra level of drama to the events, evil Connor is holding good Connor’s human partner and friend, Hank, hostage. Fun fact: Hank’s voice actor, Clancy Brown, also voices Mr. Krabs from SpongeBob. The player is met with a difficult decision, do they continue uploading the virus to the awaiting army and let Hank be killed, or do they save their friend at the expense of the revolution. I went for the option that wouldn’t result in an orphaned dog and rushed the evil Connor. This resulted in a tussle and a bunch of smashing buttons to avoid the sweet embrace of death. After the scuffle evil Connor’s gun is knocked away, which Hank quickly picks up – only to be faced with an entirely original dilemma. 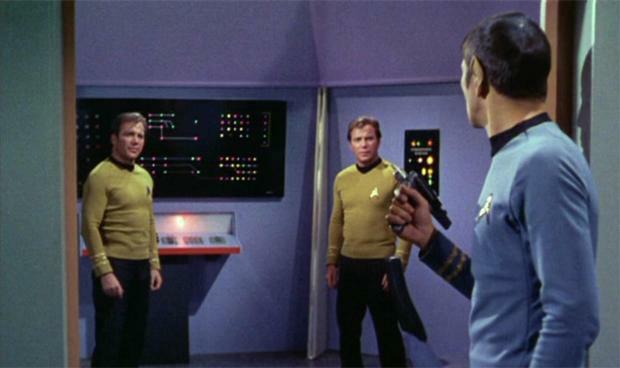 He is now pointing a gun at two versions of the same person, but is unsure which one is the naughty Connor. This is the point where I burst out laughing and had to pause the game for a breather. Detroit is guilty of a few derivative moments, but this is one scenario that has been done and parodied so many times it was hard to take seriously. This overused trope has appeared in too many forms of media to list, including pretty much every Star Trek series, The Simpsons, Futurama, The X Files, and many many many more. You can read a full collection at the aptly named TV Tropes. A dramatic moment was quickly turned into a parody, with success hinging on whether you could name Hank’s dog and son, which is also weird because both Connor’s should share the same memory. Oh well, can’t win them all! Find the evil Charlie on Twitter @clbraith, and don’t forget to follow @load_screen and like us on Facebook.